A system on board Iridium Communications' new satellite network is helping deliver critical data to aviation officials. The FAA grounds Boeing's 737 Max airplanes after receiving data from Aireon about the deadly crash of Ethiopian Airlines Flight 302. SpaceX has launched each of Iridium's 75 satellites over the course of eight missions in two years. A SpaceX Falcon 9 rocket carries 10 Iridium NEXT satellites into orbit. Only a few months after SpaceX launched the last set of Iridium Communications satellites into orbit, the new network is helping deliver critical data to aviation officials. The Federal Aviation Administration, or FAA, grounded Boeing's 737 Max airplanes on Wednesday, after receiving data from air traffic surveillance company Aireon about the deadly crash of Ethiopian Airlines Flight 302. Aireon's system piggybacks on Iridium's network of 75 satellites. Expected to become fully operational in a few weeks, Aireon can track airplanes anywhere on the planet. But the company's data is already proving to be critical, as Aireon said in a statement to CNBC that "the system was able to capture information associated with Flight 302." While Aireon declined to make company officials available for an interview while the investigation is ongoing, the company said it is working with federal officials to provide them with raw data. Even though the Aireon system has not been fully rolled out, the company is able to provide investigators with information about an aircraft's location, velocity, altitude and more. "Our sympathies go out to the families of the passengers and crew of Ethiopian Airlines Flight 302," Aireon said in a statement. Aireon gave "the data transmitted from Flight 302" to support the investigations of the FAA and several other aviation authorities, the company said. Even after dozens of countries grounded Boeing's 737 Max, the FAA did not. It was only until "actionable data" arrived from Aireon that the FAA made the decision, acting Administrator Daniel Elwell told CNBC. "We cannot comment on the cause of the tragedy or the outcome of the investigation, only that we have provided the data," Aireon clarified in its statement. The Iridium NEXT constellation of satellites sits in low Earth orbit. While Iridium's network is focused on communications, Aireon leases space on the satellites for its tracking technology. Known as an Automatic Dependent Surveillance-Broadcast system, or ADS-B, Aireon's technology in space constantly and passively receives information from any aircraft equipped with an ADS-B transponder – essentially an antenna on a plane that is sending flight data to space. What many airline passengers may not know is that airplanes are not constantly tracked by radar. While flying over land, airplanes keep in touch with air traffic controllers to relay information about the flight. But once a jet heads more than 100 to 150 miles offshore, it enters procedural airspace. At that point, air traffic controllers must rely on a pilot to relay an aircraft's position every 10 minutes. 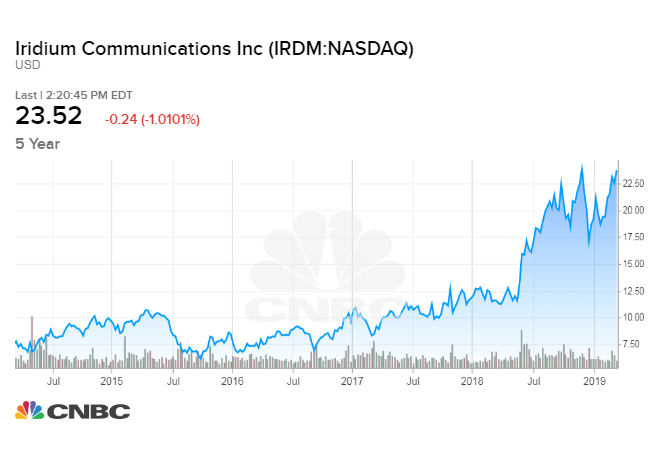 Iridium CEO Matt Desch explained to CNBC a year ago that Aireon's system means that "airlines can fly more direct routes, which could reduce both the cost and time of air travel," he said. "Aireon makes the whole planet visible to air traffic controllers," Desch said. "They are already helping the air traveling public," Desch said in a tweet on Thursday after the FAA grounded Boeing's 737 Max planes. After about $3 billion in investment, Iridium's new network is finished. SpaceX launched each of Iridium's 75 satellites over the course of eight missions in two years. Once fully operational, Iridium NEXT will offer high-speed broadband communications for "Internet of Things" applications and more. Additionally, Desch's company is partnered with Amazon Web Services, so the e-commerce giant "can extend their applications to the satellite realm," he said. Billionaire investor Ron Baron told CNBC's Squawk Box that the importance of Aireon's data to the FAA is just one example of why Iridium's constellation is going to prove incredibly valuable. Baron, whose fund is also an investor in SpaceX, bought Iridium shares at about a quarter the price they are today. While Iridium's stock is near all-time highs at about $24 a share now, Baron's fund bought 10 percent of Iridium at $6.75 a share. Baron now believes that Iridium's stock is going to double over the next four to five years. "For three years after we bought it, while they were making and launching satellites, the stock was unchanged," Baron said. "Now all of a sudden they're going to generate revenues."